June 11, 2018 By This post may contain affiliate links. Enjoy the most decadently rich, smooth and creamy, caramel flavored cheesecake after any meal. These Mini Dulce de Leche Cheesecakes topped with whipped cream, caramel sauce, and toffee bits, make a wonderful dessert or party treat. 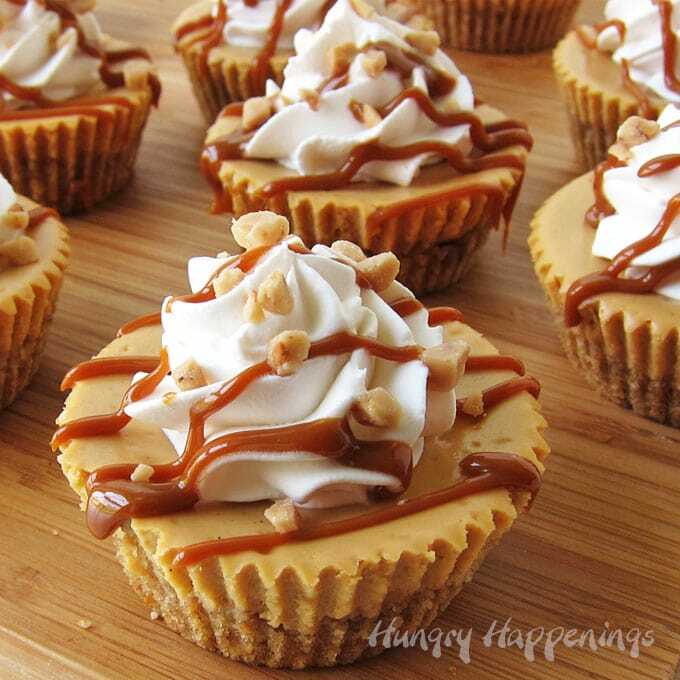 I can’t wait for you to try these Mini Dulce de Leche Cheesecakes. They are so amazingly good. 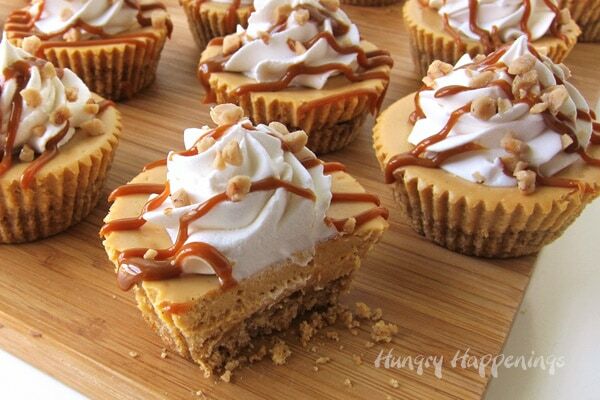 With each bite you’ll enjoy lusciously creamy cheesecake with a lovely caramel flavor blended with a crunchy graham cracker crust, delicate whipped cream, sweet caramel sauce, and bits of toffee. These desserts, baked in muffin tins, are just the right size to serve after a meal or at a party. They are super easy to make, can be frozen for up to a month, and can be served plain or dressed up. Have you ever tried Dulce de Leche? It is caramelized sweetened condensed milk. It’s thick, yet soft, deep golden brown, with a delicate caramel flavor. You can find cans or jars of Dulce de Leche either in the baking aisle near the cans of sweetened condensed milk or in the international food aisle near the Hispanic foods in your grocery store or you can order it from Amazon (ad). If you prefer, you can caramelize your own sweetened condensed milk to make homemade Dulce de Leche. Pour one can of sweetened condensed milk into an 8 or 9 inch glass baking dish. Cover tightly with aluminum foil and set in a larger baking dish or roasting pan. Fill the larger dish with water so that the water comes about half way up the sides of the smaller dish. I have a roasting pan that has a removable flat rack with handles. I set the rack in my roasting pan, set the baking dish on top, then poured the water around the baking dish. The handles and rack make it easy to remove the hot, wet, baking dish. Bake for 60-90 minutes until thick and golden caramel-colored. After 60 minutes, very carefully, remove the baking dish, uncover, and stir. If it’s not thick and golden brown in color, cover with a new piece of foil and return it to the oven for 10 more minutes. Repeat this process until the caramelized sweetened condensed milk is thick and golden brown. NOTE: You may need to add additional hot water if the water level gets below the top edge of the sweetened condensed milk. If your oven mitts or hot pad get wet, be sure to use a dry pair when removing the pan the next time. Pour the Dulce de Leche into a small mixing bowl. Fill the bottom pan with an inch of water. Pour one can (14 ounces) sweetened condensed milk into the top pan. Bring to a boil then lower heat to low. Heat for 60-90 minutes, stirring the sweetened condensed milk occasionally, until thick and golden caramel colored. Remove from heat, pour into a mixing bowl, and beat until smooth. Pour one can sweetened condensed milk into a medium saucepan. Stir constantly for about an hour until thickened and golden brown. Yep, that’s a lot of stirring!!! Pour one can of sweetened condensed milk into a large microwave-safe bowl. Heat on medium (50%) power, for 2 minutes, then remove and stir. Heat for 2 more minutes, then remove and stir. Heat on medium-low (30%) power for 8-18 minutes, stirring ever 2 minutes, until thick and golden caramel-colored. The amount of time will depend on the wattage of your microwave. 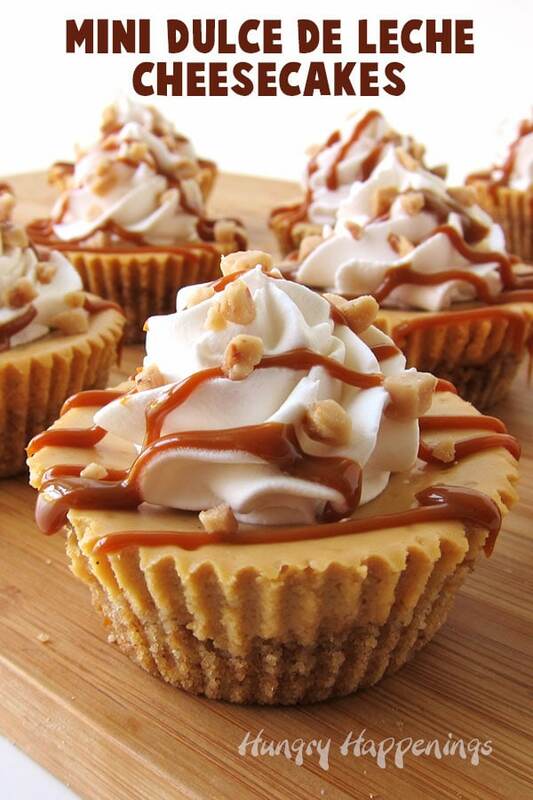 For these caramel cheesecakes you’ll need 1/2 cup of Dulce de Leche plus more to drizzle over top. 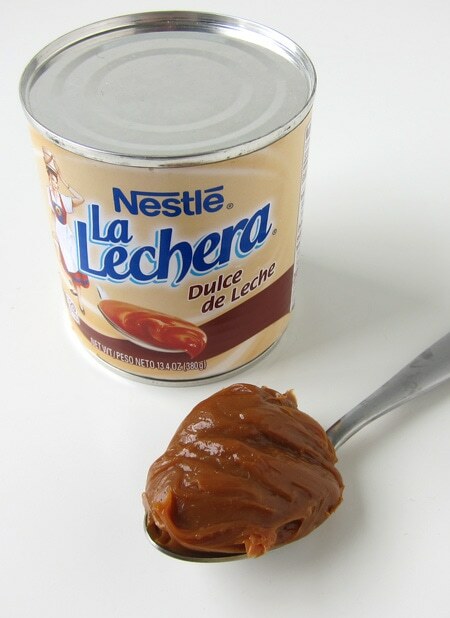 Store any remaining Dulce de Leche in an airtight container in the refrigerator. It will keep for up to a month. Dulce de Leche sauce is available in squeeze bottles in the grocery store. It is quite thin and has a deeper, more bitter, caramel flavor. You can use it to drizzle over the tops of your mini cheesecakes or you can simply heat some of the thicker Dulce de Leche in the microwave for a few seconds. You can find items needed to make these small caramel desserts on amazon (commission earned for sales). 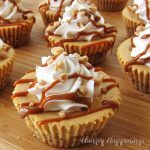 Rich and creamy caramel flavored cheesecakes made with a blend of Dulce de Leche and cream cheese are baked in muffin tins and can be topped with whipped cream, caramel or dulce de leche sauce, and bits of toffee. Preheat your oven to 350 Fahrenheit. Stir together the graham cracker crumbs, brown sugar, and melted butter. Press about 2 tablespoons of the crumbs into 12 paper-lined muffin cups. Beat cream cheese on medium speed, scraping down the bowl, as needed, until smooth. Add sugar and beat until light and fluffy. Mix in the Dulce de Leche then add the vanilla and egg and beat until creamy. Stir in the sour cream. Equally divide cheesecake filling among the 12 muffin cups, spooning about 2 tablespoons of filling into each. Bake on the middle rack in the oven for 14-16 minutes until the cheesecakes no longer look wet, but the center still jiggles. Remove and set on a cooling rack. Allow to cool for about 45 minutes then refrigerate for at least 2 hours. Before serving, pop the cheesecakes into the freezer for 15 minutes (this will help the wrappers peel off easier). Remove and immediately peel away the paper liners. Set on a serving dish or individual dessert plates and serve plain or topped with a dollop of whipped cream, and drizzle of warmed Dulce de Leche, and a sprinkle of toffee bits. To make the Dulce de Leche thin enough to drizzle over top of your cheesecakes, heat in the microwave, on 50% power for 5 second bursts of power, stirring after each, until thin and smooth. Drizzle over cheesecakes while still warm and thin. It will thicken as it cools. 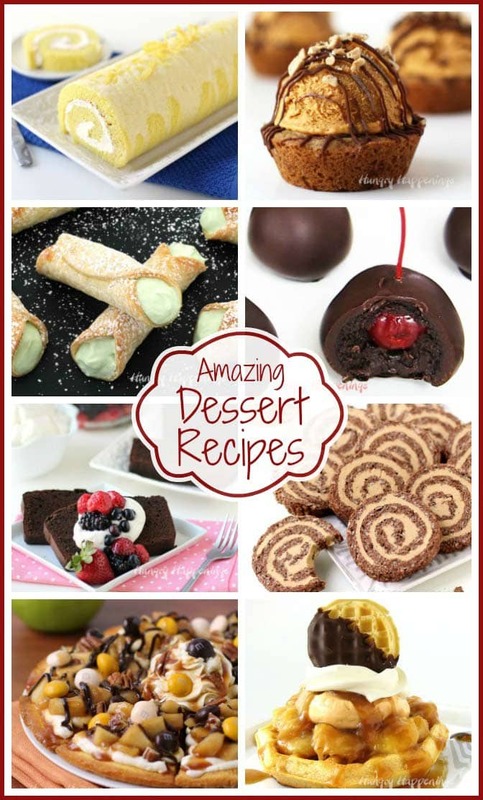 If you like these Mini Dulce de Leche Cheesecakes you might also like these other dessert recipes. I know about a thousand people who would love these, starting with ME!